Entertainment armoires are versatile furniture pieces that can house everything from a television and DVD player to full audio systems or even a desktop computer. These cabinets offer a great way to store a lot of essential electronics without putting them on display when they aren’t being used. This can be a great way to include plenty of storage and workspace in a common area while still maintaining a clean and uncluttered appearance. There are two main types of entertainment armoires: Computer armoires and TV armoires. Each of these is each of these is specifically designed and configured to best store their namesake electronics. Computer Armoires house a complete workstation behind their doors, often featuring fold-down desk space or a slide-out keyboard drawer. These can also incorporate dedicated storage space that can keep files, office supplies, and even a printer, scanner, or speakers right where they are needed. A computer armoire is a particularly versatile workspace as it allows a compact home office, a shared family computer space, or a homework station to easily fit into the décor of any room in the house. TV Armoires offer a wide central shelf where your television can perch behind the privacy of the cabinet’s double doors. 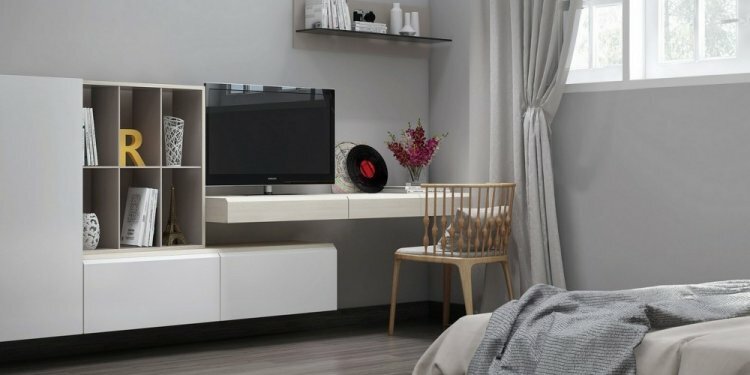 In addition to providing an ideal platform for the TV, not only do most armoires feature plenty of room for cable boxes, consoles, and extensive DVD or Blu-Ray collections, they can provide more room to store anything from extra blankets to seasonal dinnerware. Once you have the type and features sorted out, it is important to insure that the piece will functionally work in your space - and for electronics storage, a big part of that is ensuring that all the proper connections can reach where they need to. Depending on the items that you are keeping in the armoire, they will need to plug into outlets for electricity, cable, and Ethernet, and all of these combined can make for a tangled mess if not properly handled. Luckily, most entertainment armoires feature strategically placed holes or gaps for cable management. Not only do these gaps allow the cables to stay more organized, they also keep them neatly out of sight for a clean appearance. While armoires come in a range of different sizes, most are relatively large, with the average being around four feet wide. Because of its already imposing size, many armoires feature specialized doors that don’t add to the width of the piece when open. The two options for this are double hinged doors that can swing fully around to the sides of the unit, and pocket doors that slide back into the armoire. Double hinges can keep doors out of the way in most room arrangements, however, if you are opting for a corner TV armoire, pocket doors are the best solution as they don’t require any clearance on either side of the armoire. If you are looking into purchasing an armoire that has standard hinged doors, be sure to consider their size and swing radius when determining placement for the piece.